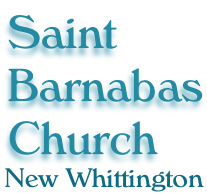 On Saturday September 29th at 11:00 we held a service at Saint Barnabas church to remember the 85 men from New Whittington who gave their lives 100 years ago in World War One. 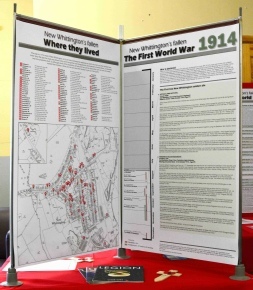 This was followed by an exhibition about World War One and the price paid by New Whittington's soldiers during the four years of bloody conflict. 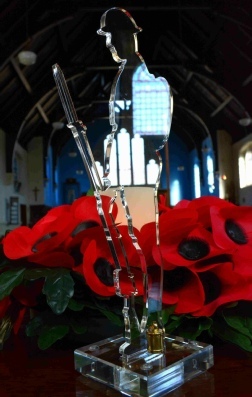 The church was decorated with Remembrance Day poppies, a World War One soldier guarded the war memorial in church, and two ‘There but not There soldiers’ (silhoutes made of perspex) sat among the congregation representing the soldiers who died and are no longer with us, but whose memory lives on. 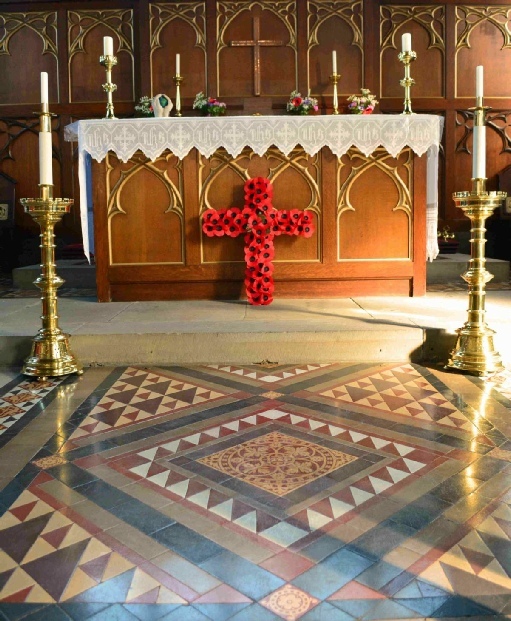 The service was beautiful and moving, a poem written by Thomas Henry Roberts, one of the New Whittington soldiers killed in World War One, was read out by his great grand daughter, Alison Megahy. 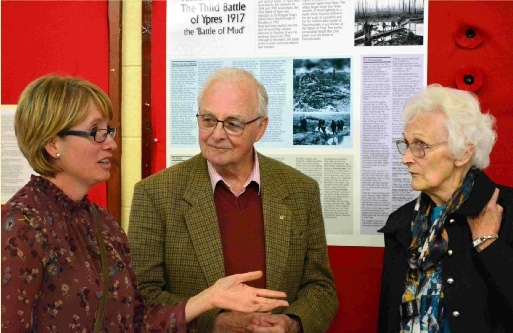 Letters written by Arthur Wedgwood to his cousin before going to France to fight were read by Marrissa Thorpe. 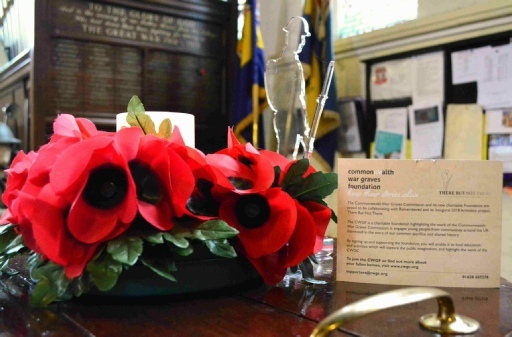 Arthur Wedgewood was Marrissa’s great, great, great uncle, at the age of 17 he was the youngest New Whittington soldier to be killed in World War One. 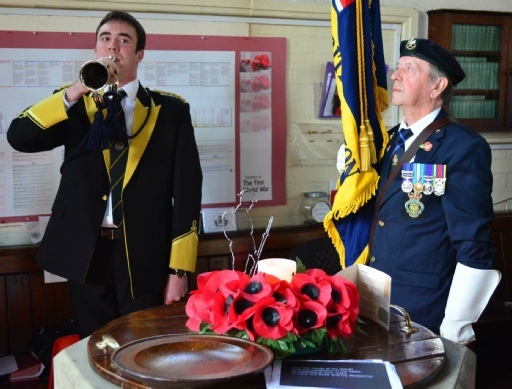 The names of each of the 85 men on the memorial was read out loud, the Last Post played by a bugler as the standard of the local branch of the British Legion was lowered, a two minutes silence held, then the Reveille played and the standard raised. 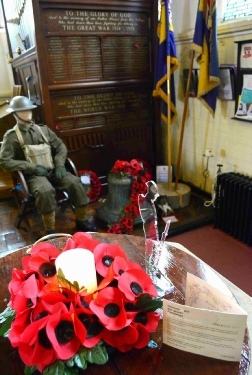 After the service everyone gathered outside the church to watch the Reverend Jo Morris, and the Deputy Mayoress, Kate Caulfield, unveil a new plaque to all the New Whittington soldiers killed in both World Wars. 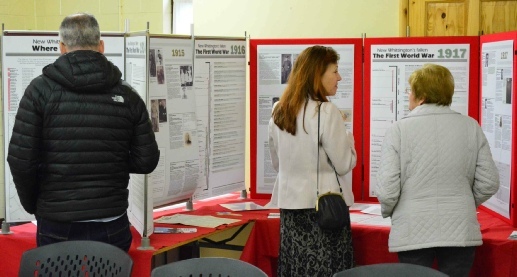 The display was open for two days, and over the two days of the event around 150 people from the local area and from various parts of the UK attended the event - people came from Scotland, Nottingham, Middlesbrough, Leicester, Halifax, Sheffield and Sutton on Sea. 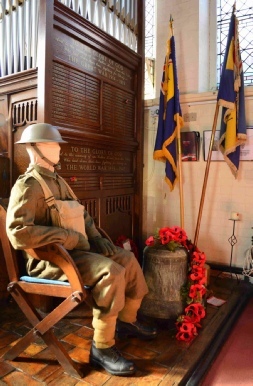 Those who attended the event enjoyed the light refreshments laid on by the church while they chatted and browsed round the exhibition, and looked at the war memorial in church. 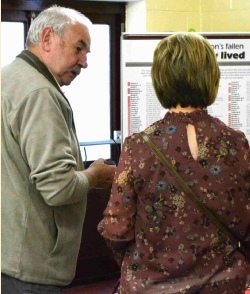 Descendents of the men named on the memorial were able to meet up and swap stories., some found out facts they never knew about their descendents, one person found out that they had a descendent on the war memorial they had not known about., and all appeared to find it interesting and moving. 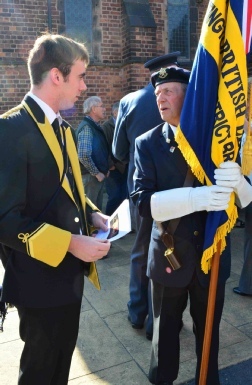 The event raised over £140 all of which was donated to the local branch of the Royal British Legion.